Today we left Rome for our next destination Florence.. This morning my exercise regime started with 3 sets of repetitions of hitting the snooze button on my alarm clock. It was yet again another hectic morning with a massive cardio effort consisting of speed walking followed by jogging, progressing to running to arrive at our destination, Rome train station. Upon arrival we were baffled as to what platform we were mean’t to be on and with 3 minutes until our train departed we had no time to guess!!! After a quick call to our travel team, we were advised of the correct platform and off we ran to the train..
We dodged in and out of crowds running the entire way which proved to be quite the challenge but alas we arrived!! 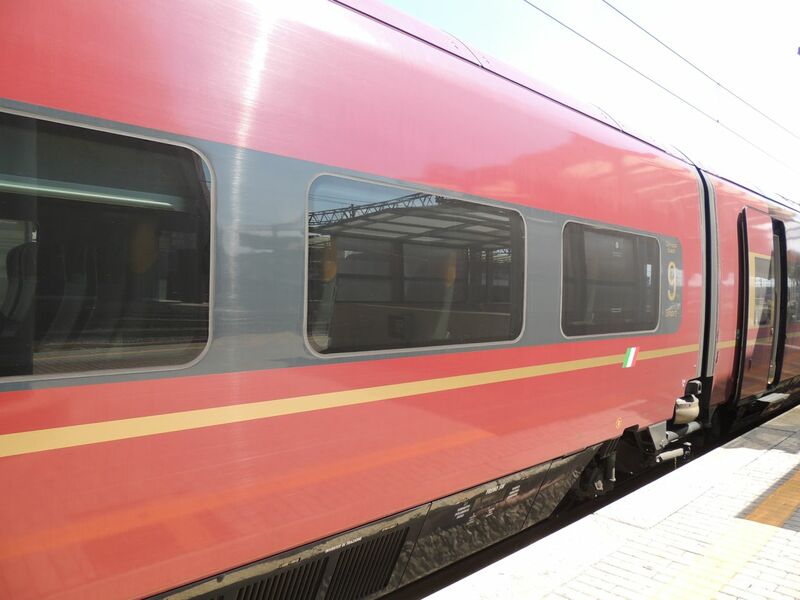 As we approached the door to the train it suddenly shut, I banged on the door and windows like a crazy woman screaming “LET US IN”, looking up and down the platform for someone that could help but unfortunately my morning snoozing effort had caught up with us and the train departed the platform. I don’t know what I was thinking running after the train still screaming STOP, STOP, STOP (at the top of my lungs I must add) as little good this did!! Fast forward we ended up getting on the next train at no additional charge and arrived at our next destination Florence an hour after schedule. 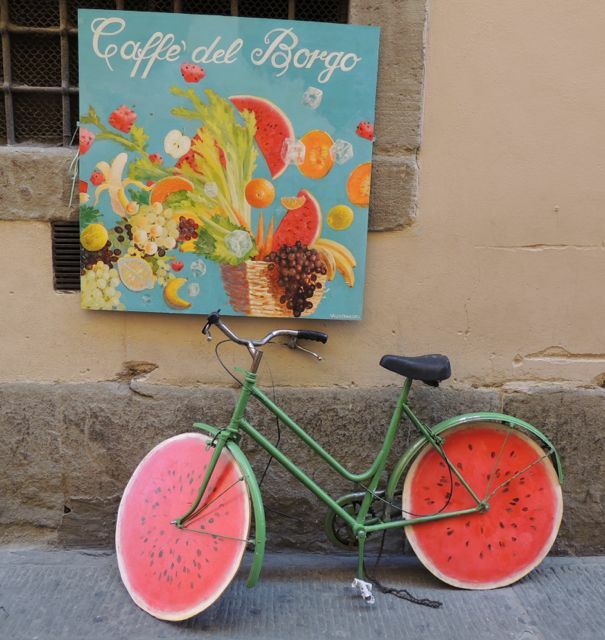 The first Quirky thing that caught my eye in Florence was a bike on display with watermelon looking wheels, this was actually advertising a cafe called Caffee del Borgo, I unfortunately did not get to dine there but I imagine they would have so much healthy produce on their menu, I loved it, what an excellent idea!! 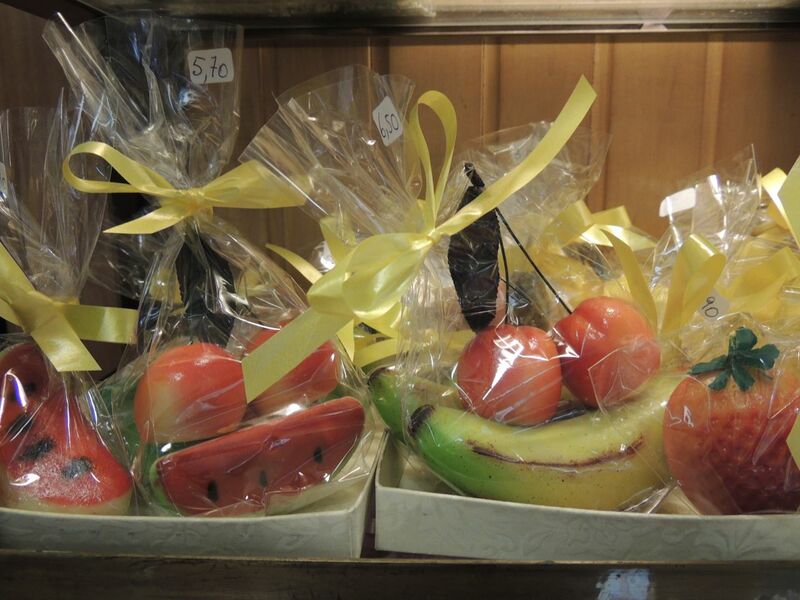 On route to our bed and breakfast we came across many quirky treats, I couldn’t help but take some snaps of the marzipan fruit that caught my eye..
Dei Mori is the name of the bed and breakfast we are staying in and wait until you hear the crazy Quirky coincidence I encountered!! Before I elaborate, let me first start by saying this bed and breakfast is gorgeous and the host Danieli is the friendliest, most hospitable bed and breakfast host I have EVER come across!! Now remember day 14 of my Quirky adventure when Vueling Airlines lost our luggage.. Remember I approached hotel DANIELI as they shared a name similar to mine and BINGO they helped with our luggage fiasco. Well today I meet out host with the same name and….. HE WAS BORN ON THE SAME DAY AS ME!! Lastly, Danieli had left a career in IT to persue his passion and as a result owns the glorious De Mori, which is similar to myself as I too have been working in the IT industry for years and am now following my passion to become a nutritionist!! The universe is sending me a sign here but I am not yet certain of what it is!! I absolutely adore Florence!! As soon as I arrived I knew I loved this place!! We are only here for one day before heading to Tuscany but I am so grateful to have this day. 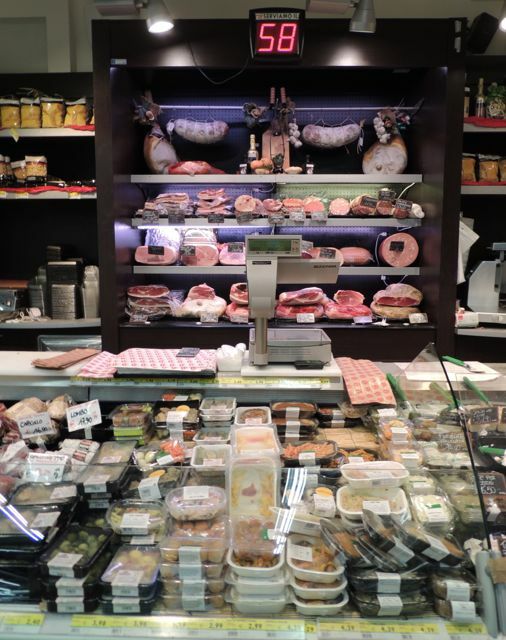 The food here is very impressive in fact, three doors up from De Mori is the most sumptuous deli that has the freshest produce!! Danieli gave us some good advice and provided an interesting fact on gelato, which in an abstract way may be seen to possibly relate to nutrition. He said to stay away from gelateries displaying their gelato as mountains as these are far from being fresh and are in fact mass produced!! Instead look for gelato that is displayed flatter and not so mountain like!! Yes gelato should be enjoyed in moderation but if I am going to eat it, I want to ensure I am eating the cleanest and freshest ingredients possible which is contrary to the ingredients in mass produced mountain looking gelato!! 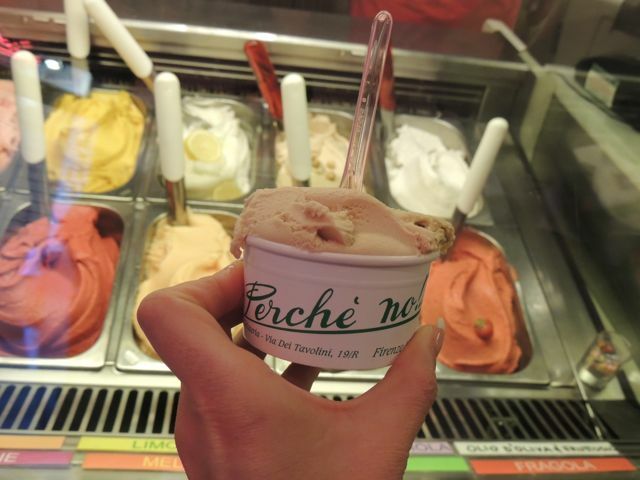 Danieli reccommended a gelaterie called Perche No! which Sean and I visited straight away. We shared hazelnut and pistachio and oh my goodness, I think this is now the best gelato I have EVER tasted.. I can definitely taste the clean ingredients, it was so light and smooth with no development of a sugar-coma afterwards!! They even sell yoghurt and soy based gelato which are much lower in calories. After our gelato indulgence we were to meet up with our friends again!! With only one day in Florence there is little time for a leisurely stroll as there is so much to see.. As a result we had a planned itinerary. 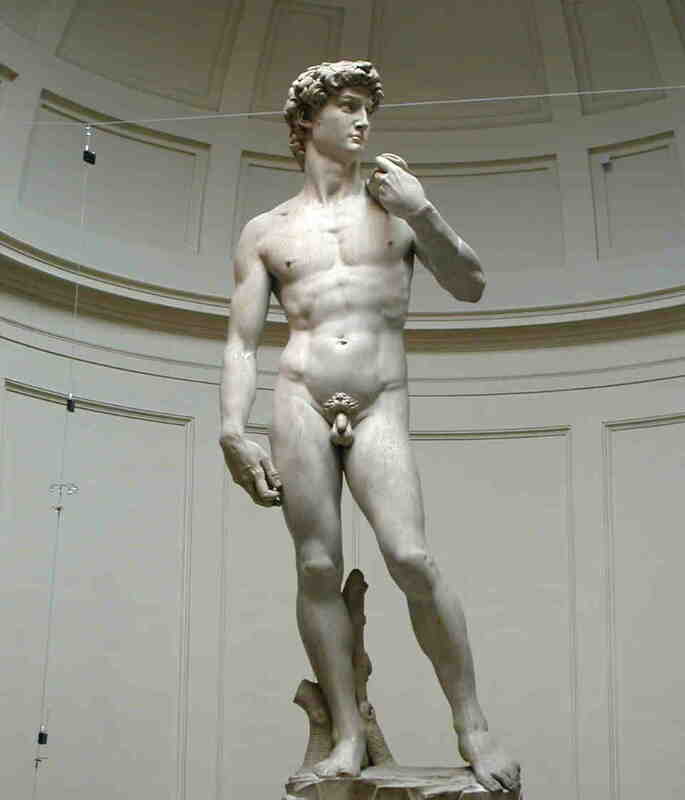 I was excited to visit “Galleria dell’Accademia” which is where Michaelangelo’s original “Statue of David” is on display.. 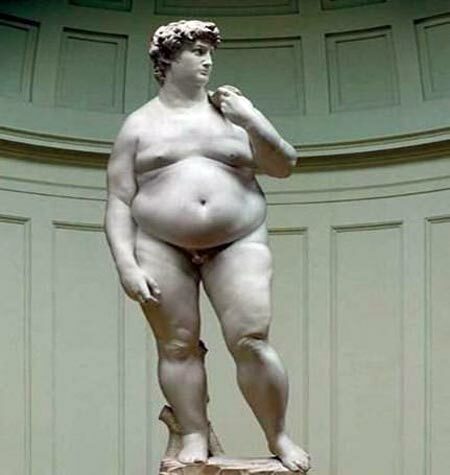 I was gobsmacked when I saw Michaelangelo’s original work!! WOW, this was seriously the most amazing thing I have ever witnessed and to think this was created with no technology and with only basic tools!! All this walking had worked up quite a thirst that it was time to hydrate, filling our water bottles up yet again with the free fresh water Italy has to offer. 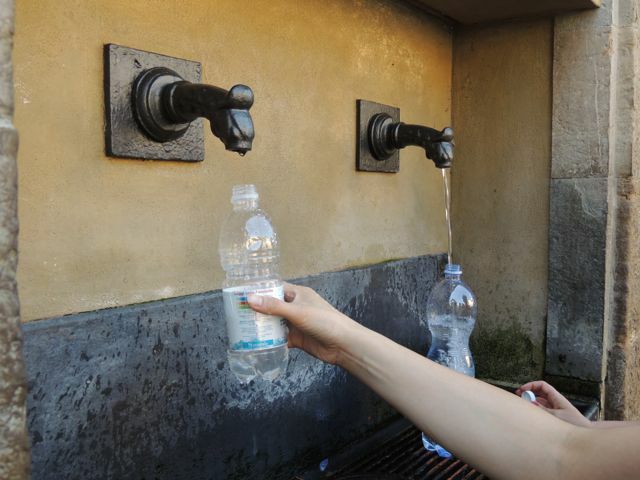 However what we were to discover was that unlike Rome, Florence offered two varieties of purified water; plain and… wait for it… SPARKLING!!! Can you believe it.. I was in heaven!! 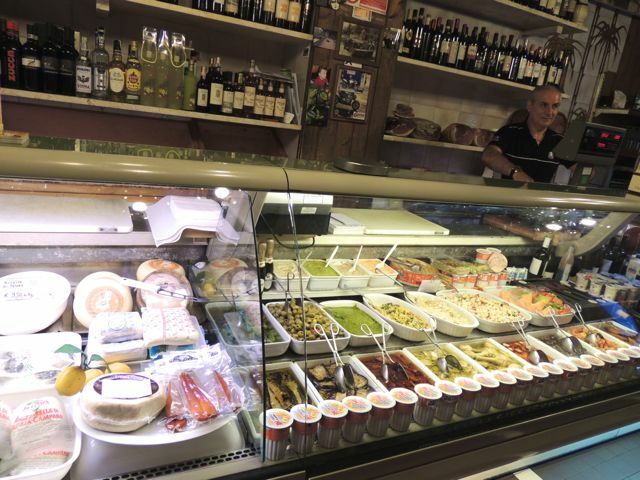 Let me tell you, the grocery store in Florence was a whole new experience for me and a great one at that as their deli section is a proper delicatessen, I was in awe by the food on offer.. It looked absolutely delicious!! I love Florence, I wish we had longer here as one day is not enough to see all the sights but most importantly taste the fine cusine that Florence has on offer.